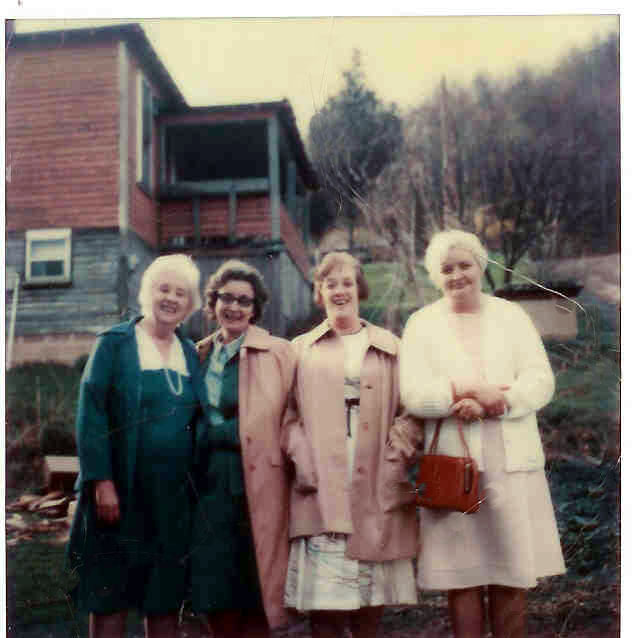 Margaret Bowling (Grandma) and her sisters circa 1979 in front of the Shanks house in Whitby. WHY have a Web Page on Whitby WV? Whitby WV is a remote coal town where time and apathy have started transforming the houses, the church, the Post Office, School and coal mine into strange shapes on a remote mountain road. In order to stop what time and apathy have taken away, I started this page to attempt to preserve and rebuild Whitby. Whitby, in my mind IS coal culture. I want to thank the people who gave me their time and effort in providing data on Whitby WV. This project will be dependant on the input of others. I am in desperate need of photos and memories from Whitby while coal was still being mined there. Links for these are at the bottom of this page. Feel free to mail me and I will reimburse folks for their expenses in photo replication and shipping and mailing. You will be credited and listed on the site should you wish to contribute. Please see here where I have acknowledged all others who have contributed thus far. If you want to see what Whitby looks like today (2003 through 2008) see the links below or click here to see what Whitby looks like. Whitbys town names are a source of some confusion. The most obvious example was the town of Battleship or Ralco which was called West Whitby in 1951. (Click here or in the map table below to see a map of West Whitby). Most of the people I have spoken with still refer to this area as Battleship and as a child I remember seeing billboards about an amusement park in Battleship. There was a replica of a battleship there which the kids called an attraction. Below are links to what I have been able to find out about the Church,Post Office,grade school,Tipple and Supers House. I promise to anybody that comes here that I will give credit to any contribution you feel is important and vital. My goal is very simple, I want to recreate the town of Whitby on the web and in the course tell you a bit about its people and history. I have created a seperate table (at the bottom) for maps. Links for personal recollections and many others are coming. Thanks for your patience. Whitby WV Grade School Memories of Whitby WV Inside the Whitby WV Elementary School Kitchen!! Whitby WV 1954 Elementary School Yearbook People of Whitby WV Whitby WV Thanks Page. Again, thanks to you, this is possible. Listen and Watch the Whitby WV Church Bell Ring!! Main 2006 Whitby WV Church Page Whitby WV in the 1930's. Includes portal and store pictures. Wood Trestle at Whitby WV! Halstead Farm at Whitby WV Inside the Mines at Whitby WV! Motor crew at Bowyer or Battleship?? Page Warden Family, Who are they at Whitby WV???? Baseball Teams from Bowyer and Stahl WV!!!! Whitby's earliest names!! 2010 Stoco Group Picture!!!! Whitby Hollow! History of Bowyer West Virginia!!!!!! ANOTHER series of People at Whitby WV,the Helvey Family!!!! DEED for the Whitby WV Church!!!! What did Bowyer West Virginia look like?? Mine Map of the Number 10 Mine at Whitby WV Updates Coming!! Updates Coming!! Whitby WV Coal Scrip! Wood Trestle at Whitby WV Updates Coming!! Updates Coming!! Updates Coming!! Updates Coming!! Send me (Mark Combs) mail.